Operational control rules determine how pumps and flow regulating structures (i.e., orifice and weir) in the conveyance system will be adjusted over the course of a simulation. InfoSWMM and InfoSWMM SA has the following three control classes. · Initial Status – The initial status editor enables specification of status of pumps, orifices, and weirs at simulation start time. · Simple Controls – As the name implies, simple controls can handle only simple operational control strategies, those that can be specified in terms of single operational condition. · Real-Time Control (RTC) Rule -InfoSWMM and InfoSWMM SA offers an advanced RTC rule that could be used to effectively simulate the operation of pumps and flow regulating structures such as weirs and orifices. Unlike Simple Controls, RTC rules allow creation of multiple conditions to be satisfied before a control action is performed. RTC rules make the definition of complex operational logic for pumps and interdependent regulators fully transparent and time efficient. Each regulator or pump operates under the control logic encapsulated into a set of simple logical rules and control functions. The system allows a schematized definition of any form and size of decision tree due to the flexibility of InfoSWMM and InfoSWMM SA Rule Format, featuring conditional clauses, action clauses and logical and conditional operators including IF, THEN, ELSE, AND, and OR in any combination. 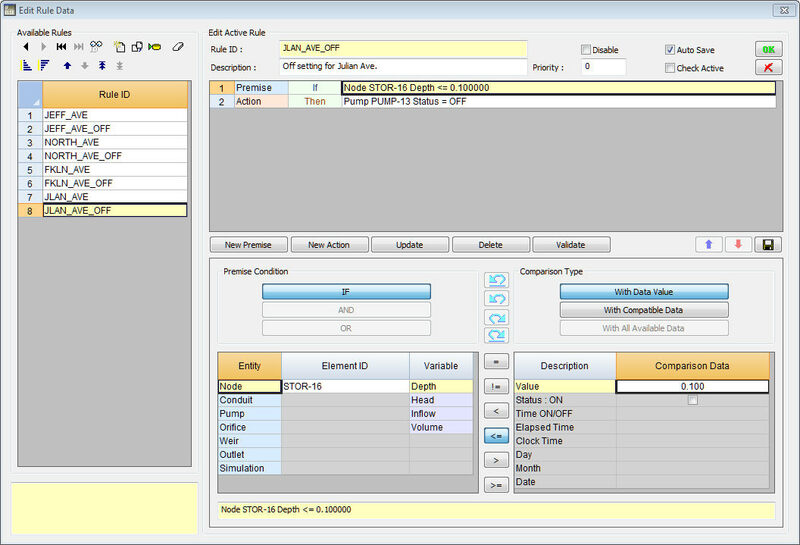 InfoSWMM and InfoSWMM SA RTC Rule Editor immensely simplifies the process of creating this potentially complex and challenging operational rule. 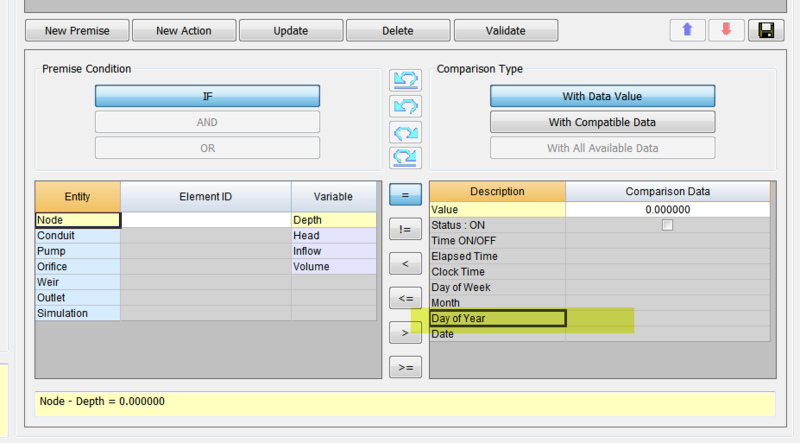 The Control Rules Editor is invoked whenever a new control rule is created or an existing rule is selected for editing. The editor contains a memo field where the entire collection of control rules is displayed and can be edited. where keywords are shown in boldface and ruleID is an ID label assigned to the rule, condition_n is a Condition Clause, action_n is an Action Clause, and value is a priority value (e.g., a number from 1 to 5). The formats used for Condition and Action clauses are discussed below. Only the RULE, IF and THEN portions of a rule are required; the ELSE and PRIORITY portions are optional. Blank lines between clauses are permitted and any text to the right of a semicolon is considered a comment. IF (A or B) and C.
The PRIORITY value is used to determine which rule applies when two or more rules require that conflicting actions be taken on a link. A conflicting rule with a higher priority value has precedence over one with a lower value (e.g., PRIORITY 5 outranks PRIORITY 1). A rule without a priority value always has a lower priority than one with a value. For two rules with the same priority value, the rule that appears first is given the higher priority. TIMEOPEN is the duration a link has been in an OPEN or ON state or have its SETTING be greater than zero; TIMECLOSED is the duration it has remained in a CLOSED or OFF state or have its SETTING be zero. § for Outlets it is a multiplier applied to the flow computed from the outlet’s rating curve. Note how a modified form of the action clause is used to specify the name of the control curve, time series or PID parameter set that defines the degree of control. A PID parameter set contains three values — a proportional gain coefficient, an integral time (in minutes), and a derivative time (in minutes). Also, by convention the controller variable used in a Control Curve or PID Controller will always be the object and attribute named in the last condition clause of the rule. As an example, in rule MC1 above Curve C25 would define how the fractional setting at Weir W25 varied with the water depth at Node N2. In rule MC3, the PID controller adjusts the opening of Orifice O12 to maintain a flow of 1.6 in Link L33. The performance of a PID controller is determined by the values assigned to the coefficients Kp, Ti, and Td. The controller output m(t) has the same meaning as a link setting used in a rule’s Action Clause while dt is the current flow routing time step in minutes. Because link settings are relative values (with respect to either a pump’s standard operating curve or to the full opening height of an orifice or weir) the error e(t) used by the controller is also a relative value. It is defined as the difference between the control variable setpoint x* and its value at time t, x(t), normalized to the setpoint value: e(t) = (x* – x(t)) / x*. Note that for direct action control, where an increase in the link setting causes an increase in the controlled variable, the sign of Kp must be positive. For reverse action control, where the controlled variable decreases as the link setting increases, the sign of Kp must be negative. The user must recognize whether the control is direct or reverse action and use the proper sign on Kd accordingly. For example, adjusting an orifice opening to maintain a desired downstream flow is direct action. Adjusting it to maintain an upstream water level is reverse action. Controlling a pump to maintain a fixed wet well water level would be reverse action while using it to maintain a fixed downstream flow is direct action.